Have you heard this call ringing out at the University of Sussex this week? Students have occupied the university’s profitable conference centre in protest against plans to privatise university services. Together with local workers, the students are determined that this will be a united and successful occupation. We have supported their action from the start as we believe this is an important part of the struggle to defend state education for everyone. 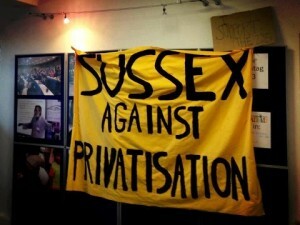 Sussex University management announced privatisation plans in May 2012 without any consultation with staff or students. Subsequently, management has repeatedly refused to enter into any meaningful dialogue with staff or students, despite the proposals including the outsourcing of 235 jobs to private contractors. This covers all non-faculty university services from catering to security and portering. Students believe private contractors will inevitably lead to higher prices for worse quality services as profits will come first. Workers know that outsourcing puts pay, benefits and pensions at risk whatever the TUPE regulations may say about the immediate transfer itself. Campus unity between students, faculty and staff will be undermined, especially as new employees will have no TUPE cover, inevitably leading to a two tier workforce. The occupation has developed in lively and innovative fashion, as might be expected in Sussex. You can keep up to the minute with events by following @occupy_sussex on twitter and via the Sussex Against Privatisation website. There’s been lots of great press coverage in local, national and education media. 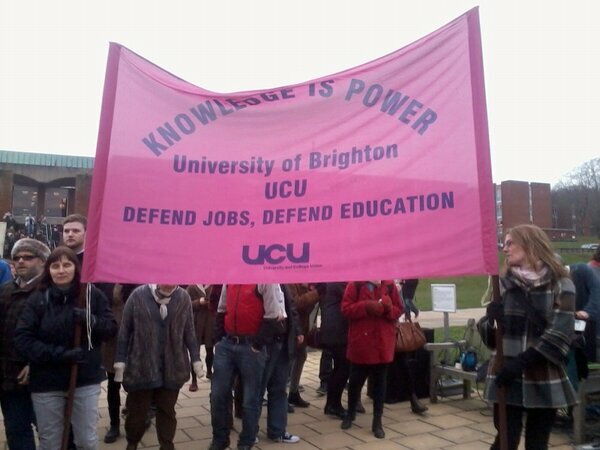 For example, read Mark Steel’s Independent article and the Guardian Education update from 13/02/13. Show your solidarity with the occupation by signing this statement on their website. Donations of food and bedding are also very welcome, as will be your support at the regular lunchtime rallies and afternoon activities being organised to support the occupation. Take branch banners along to show who you have brought solidarity greetings from. We should all be inspired by the Sussex occupation – Be the change you want to see!